Hallmarks are small markings stamped on gold, platinum and silver articles. A hallmark means that the item has been independently tested and guarantees that it conforms to all legal standard of purity (fineness). Only an Assay Office can carry out these tests, there are four in the UK- London, Birmingham, Sheffield and Edinburgh. Sponsor’s or Maker’s Mark – This indicates the maker or sponsor of the article. No two marks are the same. Metal or Fineness Mark – These show the standard of the fineness – the purity of the precious metal, in parts per thousand. 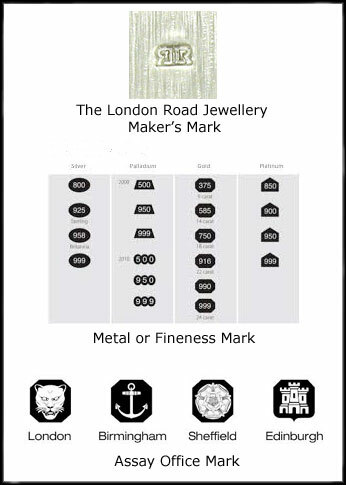 Assay Office Mark – Indicates the Assay Office at which the item was tested and marked. Until 1999 it was compulsory to mark a date letter indicating the year of hallmarking. It can now be applied voluntarily in addition to the compulsory mark. All London Road Jewellery bears a hallmark to ensure quality and confidence.